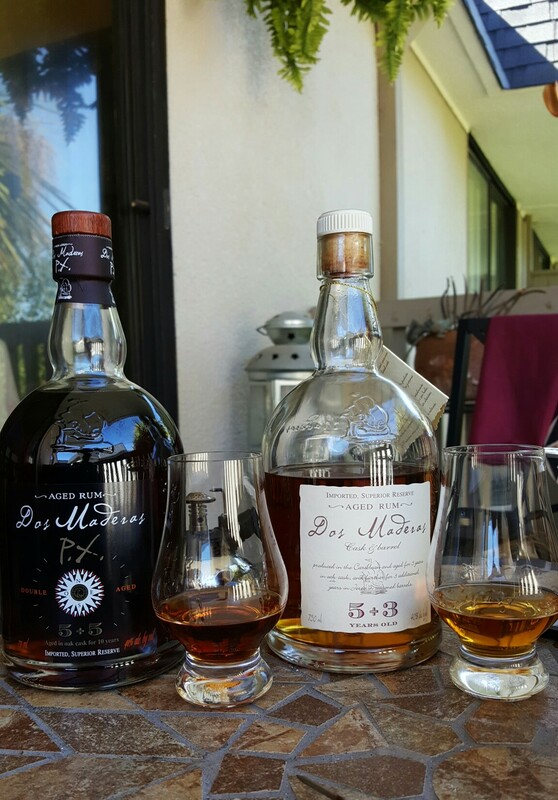 Here we have a pair of Spanish rums that go together like siblings, but in this case not nearly as closely related as the Rons del Barrilitos I reviewed previously. These two are more like distant cousins. To my palate, that they are related at all is only because they both begin with a blend of Guyana and Barbados rums. From the marketing literature, it isn’t clear if the distillates are blended first and then aged or aged separately for the first 5 years in bourbon (charred oak I presume) casks somewhere between Guyana and Barbados! Really I wish the marketing people would say more! In either case, the first number in the rum’s name, the ‘5’ refers to these first 5 years. “Dos Maderas” means “Two Boards”. Perhaps this a reference to barrel staves from two kinds of barrels? The rum is then shipped to Spain where it is blended (if it hadn’t been already) and aged for a further 3 (5+3) or 5 (5+5) years in casks that once contained the company’s 20-year-aged “Dos Cortados” (“Two Cuts”, I suspect the grape) sherry. I’ve never had Dos Cortados, but I’d certainly give it a try. One website claims the 5+5 rum is then aged an additional 2 years in “extra old” sherry casks. Why then they do not call it 5+7 or 5+5+2 I wouldn’t know. But to get to the heart of the matter, these are both good rums. To my palate they are not at all alike. Sugar: No results shown on the sugar test page. Doesn’t seem like there is sugar added. Color: On the light side of a “medium amber”, not quite yellow — the color difference can be most clearly seen in the last picture at the bottom. Legs: When swirled forms fast medium legs. Aroma: Lots of notes in this, mostly brighter fruits. Apricot and orange dominate. There is banana, some alcohol but no varnish notes. I don’t get much molasses or sugar from this, no dark notes at all except some white oak in the background. Flavors: Only a touch sweet, this is a dry rum. Reminds me immediately of English Harbour. Very smooth, but enough heat to be noticed rises up in the finish. The finish is short and a little flat. Not bitter, but not sweet either. Lightly creamy, with some butter, and a note of maple sap. Not the syrup you buy for pancakes, but a rawer sap from which it’s made. I think there is some oak in this too laying quietly under everything else. Interesting that I don’t taste any of those aroma fruits on my tongue, but they still come through the nose when you take a swallow. Sugar: One test shows 36g/l which is on the higher side, but in the end the sweetness is well cut. Color: On the darker side of a “medium amber”. Brown, some red, no yellow. Legs: Swirling, very slow, start out many tiny fingers that slowly coalesce into thick legs. Aroma: Raisin dominates, some alcohol, no varnish. Tobacco, burnt brown sugar (treacle), milk chocolate, and a very smokey charred oak. Flavors: Creamy, much sweeter than the younger rum, but not very sweet. Charred oak comes through as does the raisin and tobacco. A long sweet finish with chocolate in it, coffee and the unmistakable taste of a good sherry. This is a far more complex rum than the 5+3, sweeter and layered with much more flavor, especially on the darker side. The tobacco and coffee compensate perfectly for the rum’s sweetness leaving no bitterness. Nicely done for my palate! Both are great rums actually. 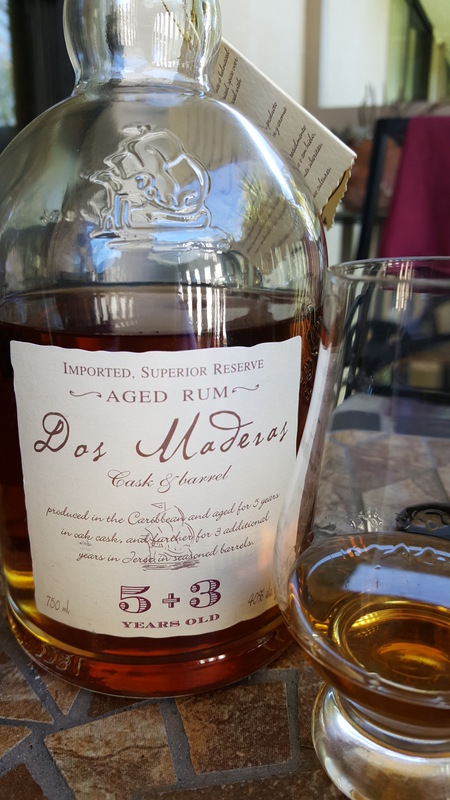 If you like a lighter, less sweet, youthful but not young, rum, the 5+3 is an excellent choice and as I noted, very similar to English Harbour for about the same price. the DM is a tad less sweet and creamy compared to the EH. 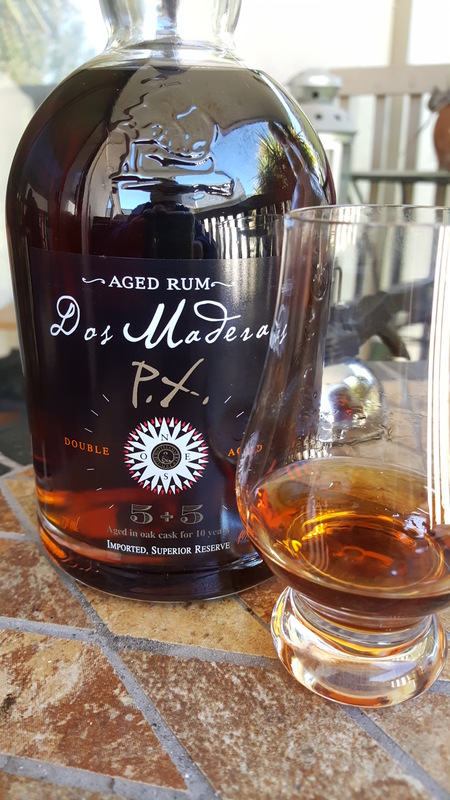 On the other side if you are looking for a sweeter rum that isn’t at all “very sweet”, the 5+5 is superb and not too expensive at around $45 here in California. 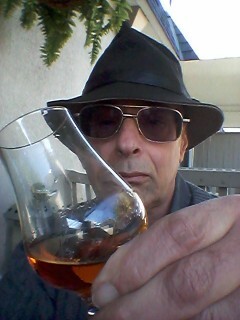 In particular if you like a good sherry (I do, is the only wine I ever care to pair with cigars) you will enjoy the DM 5+5. Drink up me hearties! And don’t forget to enjoy a good cigar while you’re at it!